So I have a question. Most of my heros are orange and many have 5 stars. So here’s the issue. I have a few who are still purple+4 with 5 stars. They have enough shards to forge, but Idk how to make them orange. They are all at level 95. So I’m not sure how to do it. Thanks! I believe you’re on s8. Then promote them like you did with your other heroes? You promoted your other heroes and suddenly forgot how to do it? Geez turtle no need to be snide with me. I didn’t understand how the orange rank worked. Hi, ive got a few orange now but how do u forge?? Ive max shards way over and relevant scraps … stuck! Cant see a way to forge? To forge, you go into epic dungeon and find the square with the orange anvil icon. OK in forge you need 40 shards and 20 epic shards then to make your Crystal you need 50 shards and 5 epic shards hope this helps you. am new to the epic dungeon & dont get how to use the forge. have a hero orange with everything needed to forge. crystals that say ready to fill. when find the forge in epic dungeon it does nothing. am i suppose to do something to “activate” it? Each hero requires 40 epic scraps and a handful of hero shards (I forget the amount of those) to initiate epic unlock in the forge. Each hero when made epic starts at level 60 and will continue all the way up to whatever the server cap is for team level. 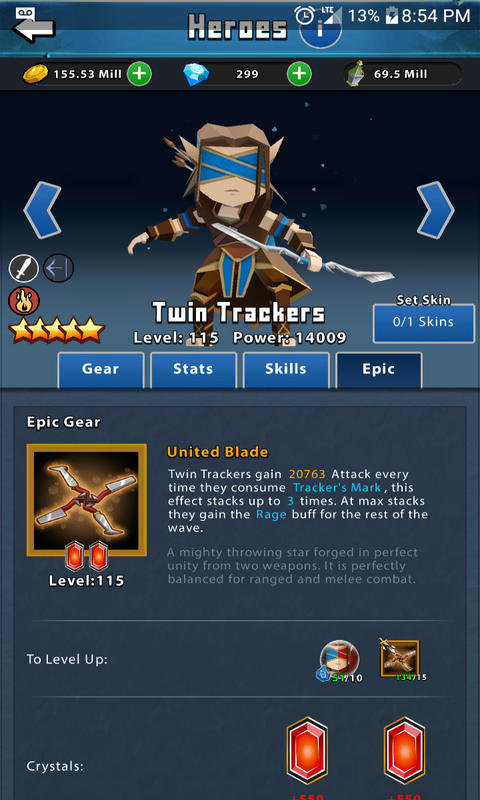 You’ll need an ever increasing amount of epic gear around every 10 upgrades. Hero shard costs per lvl up are 5 shards. And, some heroes are not eic capable yet. Like fox. Make sure you have heroes in your team that are epic capable. Just because they are orange, does not automatically mean epic capable yet. Look to make sure your heroes have a empty gear icon at top which should appear once orange rank is achieved for that hero.